Warning: Please do not try these earphones, unless you want to ruin listening enjoyment with other earphones. I am trying to erase the magic and go back to my regular earbuds. These are da bomb - these S$1,599 AKG K3003 earphones, which omy.sg and AKG introduced to a group of bloggers (I only know about earphones because of hubby who plays and writes music, otherwise would be happy with Apple default buds). Yes, there's a voting contest too, where you can win the Quincy Jones Q460 headphones (pictured right). I gave my first impressions on the K3003 earlier. This is hubby's more detailed take. (By the way, the K3003 is all sold out! Can you believe it?!? New stock will arrive end month or early next). 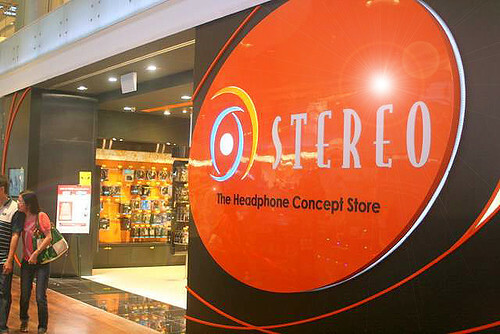 We popped into Stereo at Orchard ION to check out the K3003 by AKG. Due diligence: these are high-end, expensive in-earphones. I didn't have the chance to try it on an actual commute, but I did have to contend with an IT roadshow going on just outside the shop, anchored by a very LOUD emcee! The in-ears had an elegant silver finish on the housing, an an appropriately long thick, black anti-kink cord. For the price, I was expecting something more ... flamboyant, but honestly, with earphones of this sort of quality and price, its understated elegance, and focus on performance made total sense. So: was it worth the money? Would I be able to hear the angels singing?! Default: a neutral, "true" sound that is very balanced and faithful to the original recording. I ran acoustic tracks by Jose Gonzalez and even quieter numbers by Janis Joplin and Stevie Nicks through this one, and they came up sounding full, wide and clean. Rich bass: I played a Motown track, "Rescue Me" by the singer Fontella Bass and featuring the dance-tremor inducing basslines of James Jamerson, who together with his Detroit bandmates, were responsible for hundreds of incredible hits, including "My Girl", "Bernadette", "For Once In My Life" and more. Motown tracks, however digitally remastered, are notoriously hard to reproduce because of the limitations of recording technology in the 1960s. On lesser earphones, one can feel the bass is barely there. Whoa, on these, it was like sitting next to Jamerson - that rich, powerful, demanding Fender Precision bass working away at chromatic runs, ostinatos and glisses. I was a happy Mr Camemberu!!! Camemberu herself was bobbing away to the sounds of Michael Jackson. Treble emphasis: this third filter really works well on vocals and guitar-driven songs or solos. Crystalline highs, and amazing clarity. For the first time ever, I could hear the buzzing of the strings on Jose Gonzalez's fretboard as he sang, Carlos Jobim-like, on "Crosses". The earbuds sat oh-so-comfortably, and once I got a snug fit, they shut out that annoying emcee and the sounds of the hustle and bustle around me. Even when Camemberu and the knowledgeable and affable sound specialist at Stereo were chatting right next to me, I could barely hear them through the amazing seal. And, of course, the earphones come with the signature, unobtrusive AKG remote. The fact that you can enjoy three different listening experiences, just perfect for the fussy audiophile who needs to experience a song as it should be. Go. Check out and test the AKG K3003 at Stereo outlets at ION Orchard (#B4-23/24) or Plaza Singapura (#04-06). Don't let me influence your expectations though. Judge it for yourself. 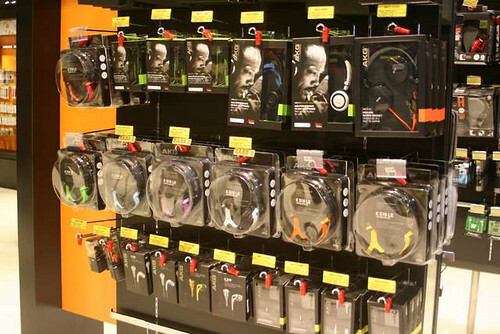 They have an amazing variety of earphones. Hey, here are the AKGs, including the Quincy Jones line! These are great too, but the K3003 are matchless. I wish I had S$1,599 to spare but even if so, I sorely need a new DSLR or better lens more. Remember to vote in the contest cos three people will win the really cool Quincy Jones Q460 headphones!